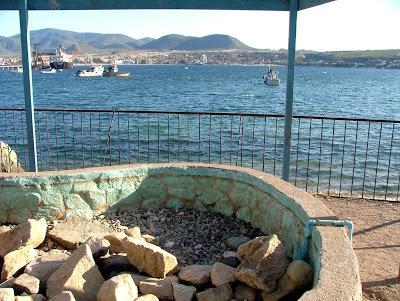 I woke Friday morning in Coquimbo, a desert region eight uncomfortable hours by bus from Valparaiso. The green, flower-covered hills surrounding the Universidad Catolica del Norte campus are an anomoly, according to my oceanographer hosts; usually the landscape here is brown. But it´s rained three times in the past few months, and the dormant wildflower and grass seeds took full advantage. It´s been a fascinating trip, but also exhausting, and while I´ve had the lucky opportunity to chat with Peru and Chile´s smartest marine scientists, I haven´t had much time for play. The resplendent Valle del Elqui is only an hour away from here by bus, and several people have encouraged me to visit. Apparently it´s an energy vortex, like Sedona, where electronics and brain waves behave erratically. But yesterday was packed with interviews, and today´s flight is in three hours. No time. My wild Friday night consisted of sitting in bed at the hotel and watching the U.S. presidential debate on CNN. The election seems to be of peripheral interest here and in Peru; a few taxi drivers have asked about Obama. They have a sense that he´s the good guy and think it´s a big deal that he´s black, but don´t know much else about him. They have all asked: Who is he running against? When I tell them John McCain, they ask: What about Hillary Clinton? Fair enough. I will admit a little sheepishly that before this trip I couldn´t even name the presidents of Peru and Chile--Alan Garcia Perez and Michelle Bachelet Jeria, respectively--much less the presidential hopefuls. Still mildly sick with a sore throat and fatigue, as I´ve been all week. Robin overcame her gut pains, flew back to Peru and is trekking Machu Pichu. My computer is no longer responding to the Chilean plug power adapter, so I´m typing on the hotel´s machine. I´ll have to upload photos when I get home tomorrow. Home. The thought is more soothing than this cup of tea. Hope you are feeling better and safely on your way home. It's been great reading your daily blogs and I'll look forward to talking to you.